Renewable energy has historically been seen as an alternative to burning fossil fuels like coal and petroleum products for consumable energy. However, we have come to learn that far more than the core reasons for pursuing renewable energy, there are plenty of other benefits of clean, renewable energy. It has become increasingly clear that renewable energy is just better than fossil fuels — for people and the environment. 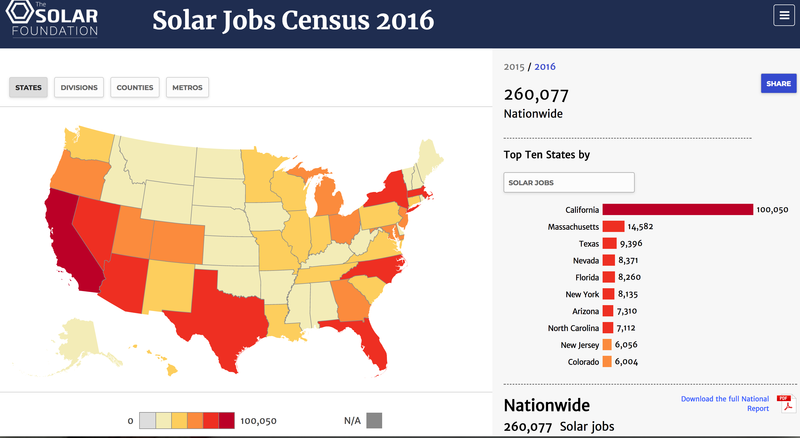 As CNN, CleanTechnica, and others have reported, solar employment grew 17x faster than the whole US economy in 2016. Together, solar and wind energy jobs grew 12x faster than the economy as a whole. 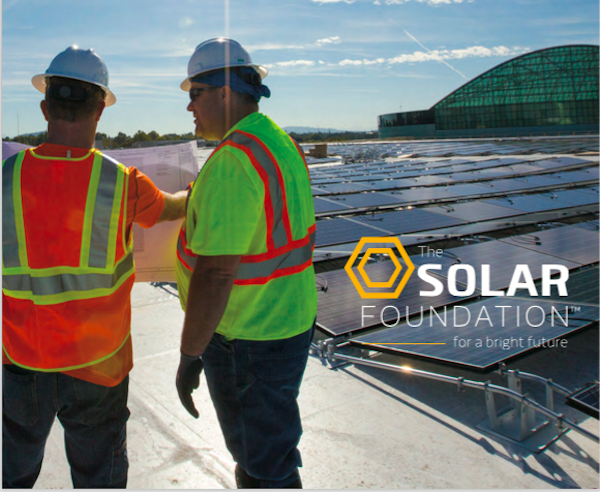 Approximately 260,000 people are employed in solar jobs in the US as of 2017, while over 100,000 work in the wind industry. They tend to be jobs people like, because they perceive them as being good for society and the planet. They are skilled jobs, so they also pay fairly well. Obviously, they are also much safer than working in the coal or petroleum industries. Coal and oil workers are exposed to harmful chemicals which sometimes make them ill or very ill later in life. Some even die prematurely from such exposure, like coal workers from lung diseases. The costs of treating ill and/or dying workers are extremely high, and those workers can no longer work so they can’t provide for themselves or their families. Solar and wind power jobs don’t expose workers to toxic chemicals, explosions, oil fires, mine collapses and so forth. Additionally the coal and petroleum industries don’t exactly have stellar track records when it comes to preventing injuries or taking care of injured or sick workers. Additionally, these jobs are not dead-end, low-paying, or unfulfilling ones. It is also expected that far more new jobs will be added in the clean energy sector in the coming decades since these are the most competitive options for new electricity generation capacity. Hi-tech jobs receive quite a bit of press, particularly ones in Silicon Valley, but cleantech jobs for some reason don’t get as much attention, even though they are arguably more important for human health and that of our planet. It’s very beneficial to the American economy that hundreds of thousands work in clean energy like solar and wind power, but in China, there are reportedly well over 2 million people working in solar power. So, it is possible for millions of people to be employed in solar power, even though the conventional view might be that solar power is sort of a ‘fringe’ technology. Clean energy sources don’t produce copious amounts of toxic air pollution, like fossil fuels do. The number of premature deaths due to air pollution worldwide is in the millions. Somehow, the climate change deniers never mention the enormous human toll resulting from the burning of fossil fuels. The cost to society in terms of health problems, death, and pollution of using coal in the US has been estimated in the hundreds of billions. Of course, the burning of fossil fuels is a primary contributor to the production of air pollution. Further, pollution contributes directly to climate change, which is increasing temperatures in some areas, resulting in more plant growth and greater pollen production. More pollen means more asthma for children, and other age groups. However, the plant growth isn’t normally the type we want — with agriculture threatened the world over from increasing drought, heat, and flooding. Tens of billions of dollars of our yearly trade deficit are linked with imported oil in the United States. The trade deficit overall is hundreds of billions each year, so oil makes up a somewhat sizeable portion of the total. Our reliance on foreign oil contributes to the trade deficit, which in turn puts downward pressure on the value of American dollars. If we don’t decrease our over-reliance on imported oil, it will be hard for us to reduce our trade deficit and increase the value of the American dollar. Carrying too much debt and having a suppressed dollar value hurt our national economy. Solar power could provide enough electricity for the whole United States. We could also install enough solar power, wind power, and energy storage to eventually provide electricity to tens of millions of EVs, if not the whole American vehicle fleet. Energy independence at last? At that point, there would be no need to send colossal amounts of American dollars overseas for foreign oil. By investing in clean energy, we will be protecting the economic future of America and making our country much healthier. The story is similar for countries around the world that aren’t oil giants. Would there have been an Al Qaeda without Americans buying millions and millions of barrels of Saudi oil? Steve Yetiv, an Old Dominion University professor of political science, wrote in an opinion piece in the Christian Science Monitor, “Oil has helped fuel and motivate them, while globalization has allowed them to exploit that fuel to do things that otherwise would be more difficult and costly.” He was referencing how Al Qaeda has benefited by the purchasing of Middle Eastern oil. Some of that oil is purchased by us Americans. Before 9/11, we might have been shocked to find out that at times we have been paying for gasoline that resulted in money going to terrorists who want to damage our country. Post 9/11, any adult could see the connection between our over-reliance on foreign oil and some terrorists groups. However, Osama Bin Laden declared war on the United States in 1996, so the very hostile intention was activated before many of us knew what was going on. In fact, hostilities between the US and some terrorists like Al Qaeda and ISIS have lasted over 20 years. Over 7,000 American soldiers died in the invasions of Afghanistan and Iraq. Over a trillion dollars has been spent by the United States on such campaigns due to the conflict. Saudi Arabia is one of the top petroleum sources for the United States, and the consequences have been very severe. Would transitioning to more solar and wind power solve all these complicated geopolitical problems? No, but they would at least help us withdraw our resources — human, material, and financial — to better apply them within our own country and not put them at such risk. Adding much more solar, wind, electric vehicles, and energy storage would put us on a much more sensible and less damaging path. Germany decided to embrace clean, renewable energy and has made a great deal of progress. In the process, this European nation has emerged as a new technology leader and set an example to the world. That could have been the United States, but we have lagged behind. Germany has been able to take in billions by exporting its surplus electricity. Clean energy installations might even be increasing tourism in some parts of Germany. If the price of one barrel of oil is $61 in 2018, what will it be 10 or 20 years? Will it double, triple, or increase even more? Why not invest in alternative energy so we can avoid increasing oil prices which may become extremely high? Why be held captive to market fluctuations when we can strike out on our own energy-independence path and avoid sending huge amounts of money to places where there are people who hate us and want to destroy us? It is already true that renewables are saving American companies billions of dollars each year. Of course, there are many more benefits and scores of examples of how renewable energy benefits the grid. Entire books are devoted to the subject of renewable energy, but for one online article, there isn’t enough space to cover them all. Suffice to say, there will also be new benefits created as renewable energy expands around the world and gets smarter — ones that we might not have anticipated yet.